My spice cabinet has been driving me crazy! I can't ever seem to find anything and there is no flow to it what so ever. So I decided to clean the whole thing out. I filled up two counters with stuff. I can't even tell you how many duplicates of things I found. Which I know I bought because I thought I didn't have any. 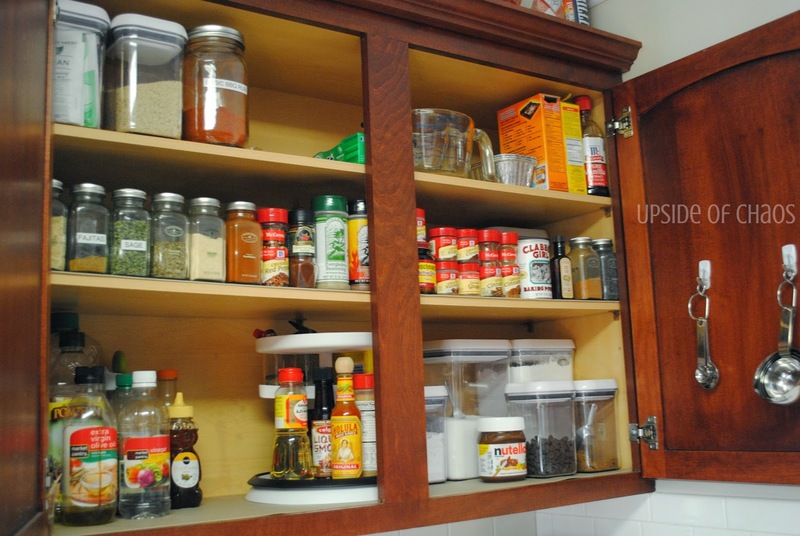 Once I got it all on the counter I decided to look at what I had and decided the best way to use this cabinet is to do half with my my spices, herbs, oils etc and the other half my baking ingredients. I also added Command Hooks to the doors for my measuring spoons and measuring cups. 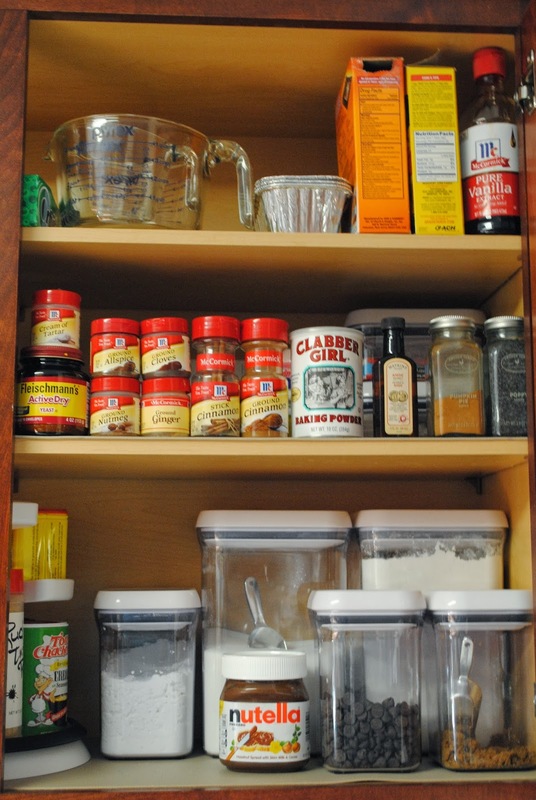 No more searching high and low for the my 1/4 tsp when it's right there! I really feel like I can take a deep breath. It just makes me happy to see everything lined up all nice and neat! Don't judge my spices. We have massive containers of the stuff we use most often from Sam's Club. They're in a totally separate cabinet closer to the stove. 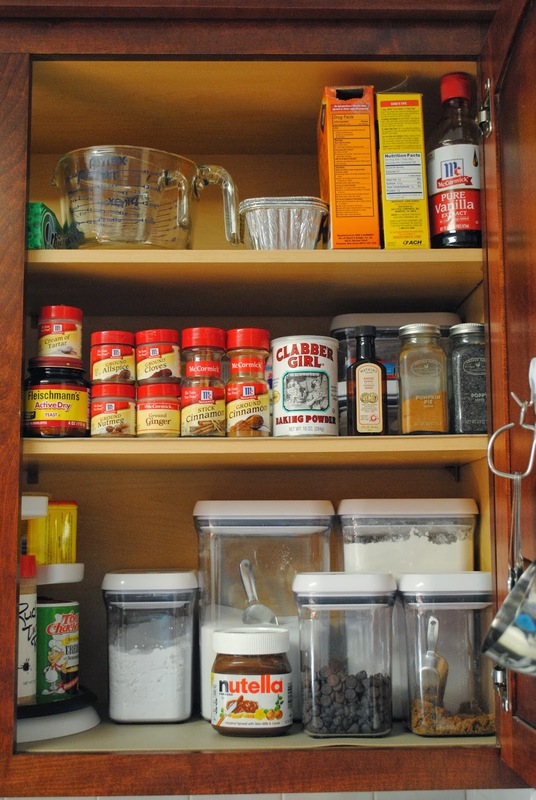 And I don't know about you but I love my lazy susan in the cabinet. 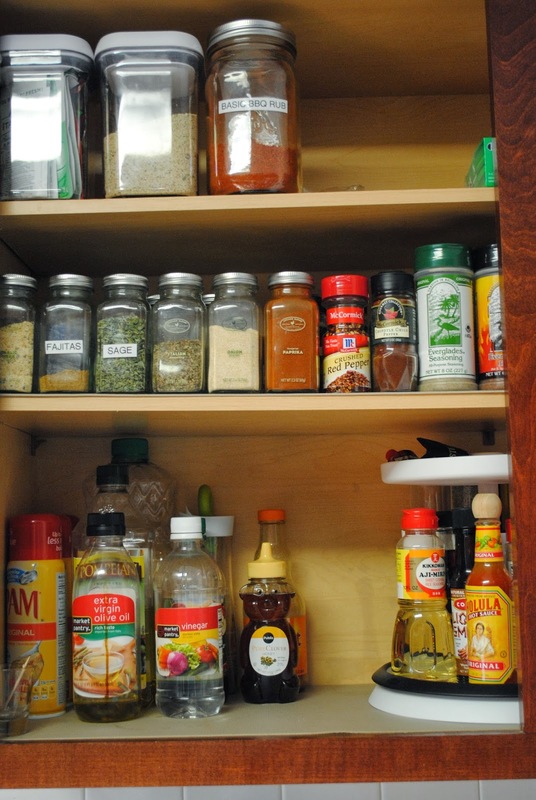 Behind my spices are extras that are used a lot less often than the others. Like once or twice a year. The items I use the least are behind everything else on the second row. Such as food coloring, candles for birthdays and cupcake liners. Did you see my adorable little scoops in these containers I got those at World Market for just a few dollars! I love them! A super short way of explaining the Scrum board: a large board with various tasks listed in columns: To Do, In Progress, and Done. Each person selects a task and moves it along the columns and does it to completion and then chooses another task to do from there. The nice thing about this board is that it allows everyone to see where the others are in their tasks as well as providing accountability. 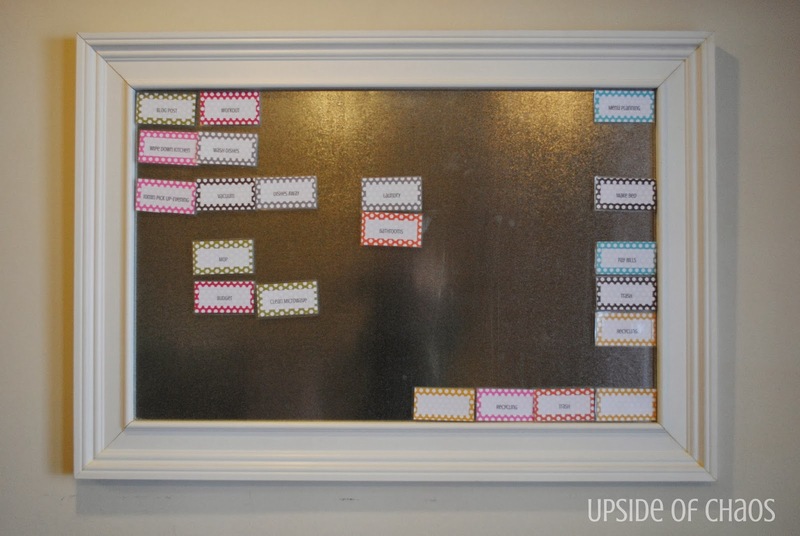 Now typically most people would use a large white board with post-it notes to track all the tasks and their progress. But let's face it...I REALLY don't want and enormous white board cover in post-its in my house for the world to see. So we decided why not a big magnetic board with a nice moulding frame instead. Some of you might be wondering why I agreed to give the Agile Method a shot in our house. I already had a daily, weekly, monthly, and quarterly checklist I worked off of...but hubs won me over when he said I could put tasks on the board that he needs to do and then I won't need to remind him to do them because it will be right there in the open for everyone to see. He would also be able to look at the board and see what I did for the day as well as what I was not able to get done and then he can help me out. SOLD! We came up with this idea on a week night and we prefer to save our Home Depot trips for the weekend so I decided to use some card stock paper I have to start on the tasks. First thing I did was type out tasks that are set in stone for us. Then I printed them and cut along the lines. I then cut my card stock down to size. Using some double sided tape I put each task onto the card stock. I even left two blank ones to hand write in tasks once they are laminated. Next up was my handy laminater. These are going to have to be sturdy since we're putting magnets on the backs and they will be moved often. Then I glued the magnets onto the back of each task. Now comes the hard work, building the Scrum board. 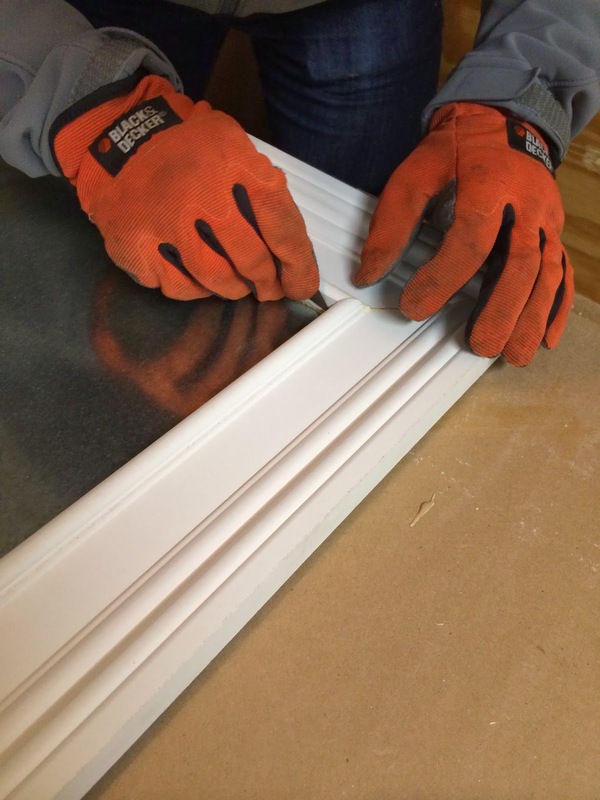 When we went to Home Depot we picked up some moulding that we really liked along with the galvanized sheet metal and a sheet of hard board for backing. Using the circular saw and a level as a guide we cut off the extra wood on the hard board. Next up adhering the sheet metal to the hard board. We used this from Loctite. Make sure whatever type of adhesive you use to read the instructions. Since we were using the metal we had to mist the metal lightly with water. Don't mind the tent drying out in the garage. 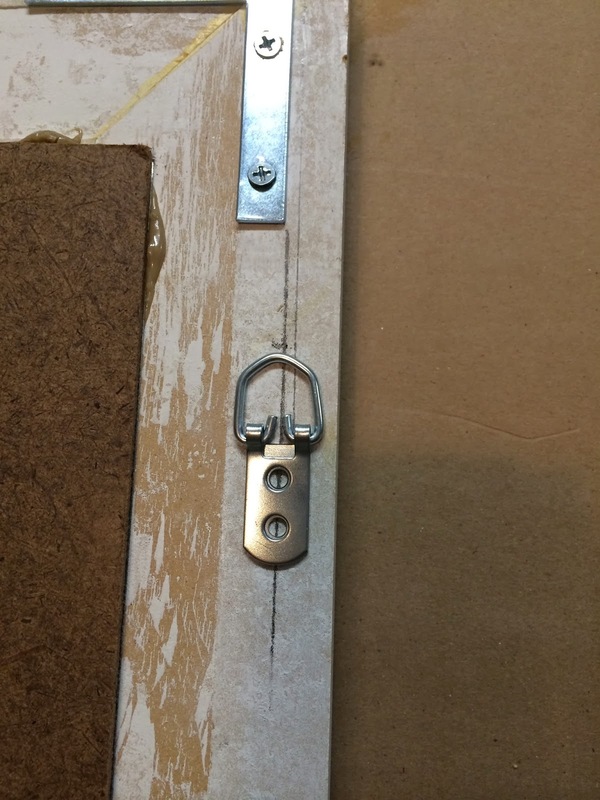 Once your glue is ready carefully lay the sheet metal on top. The instructions for our glue said it would take 30 minutes to set up and 24 hours to be ready. On to the moulding and to cut it we used our miter saw at 45 degrees. Several cuts later we have all four sides of moulding for our board. 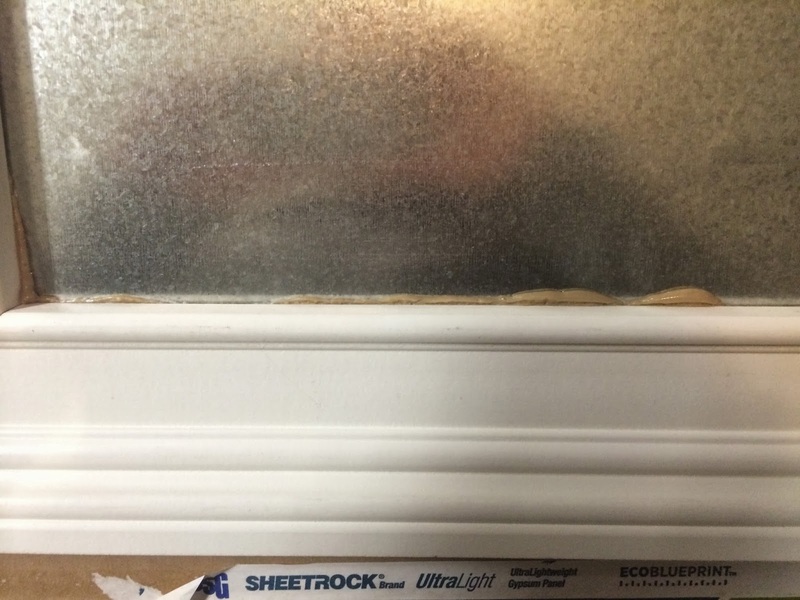 So to put our moulding together we took our wood glue and put in on the cut edges of our moulding and placed everything together. Then we took a tow/ratchet strap and carefully wrapped it around and cranked it so it was nice and snug providing good tension to hold our boards together over night. The next day when everything sat long enough we flipped the moulding over and laid the sheet metal on top so we could make sure we got the corners of the frame nice and strong by adding some L brackets to the back. 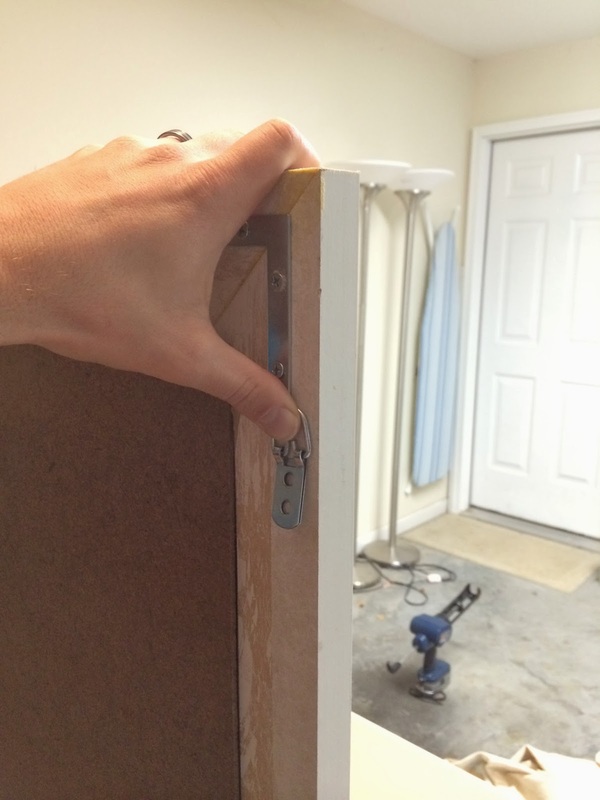 The screws that were provided were a little long so we used some shorter ones we had on hand. 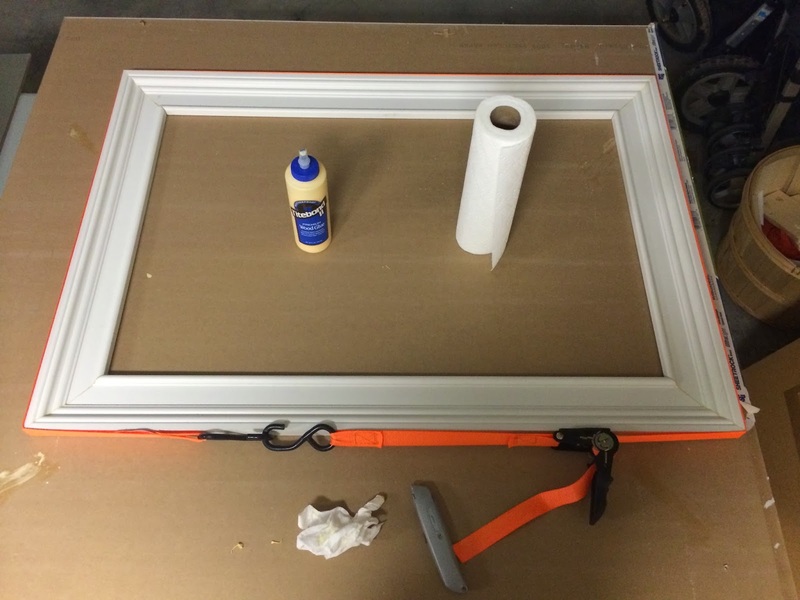 Next we took our tube of Loctite and placed the adhesive around the edges to adhere our sheet metal to the frame. We did not center the board top to bottom but lowered it down so that all the weight would be towards the bottom of the frame when it was hung. Give it a nice push and make sure its on there. We cleaned up any glue off the back and then weighted it down with our corn hole set so it could set up for 30 minutes. While we waited on the glue we decided to run out and grab a bite to eat. Because lets face it all this work makes us hungry. Now that we're properly nourished time to add some hardware. 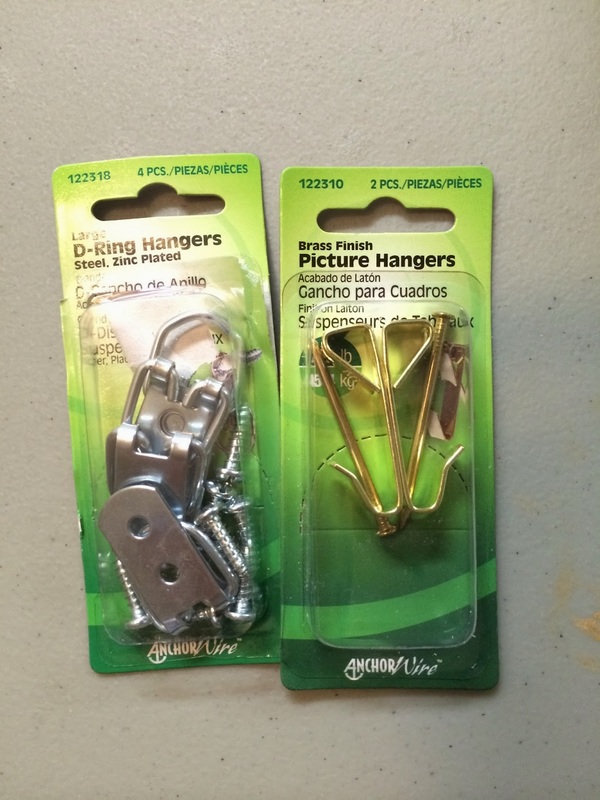 We got a 4 pack of D-rings and a pair of picture hangers (100lb limit). It might have been a little over kill but it beats it falling down on one of us. First we decided on placement. Measured everything out perfectly and put the screws into the D-rings. We had to wait the remaining 24 hours for the Loctite glue to set before we could hand it. 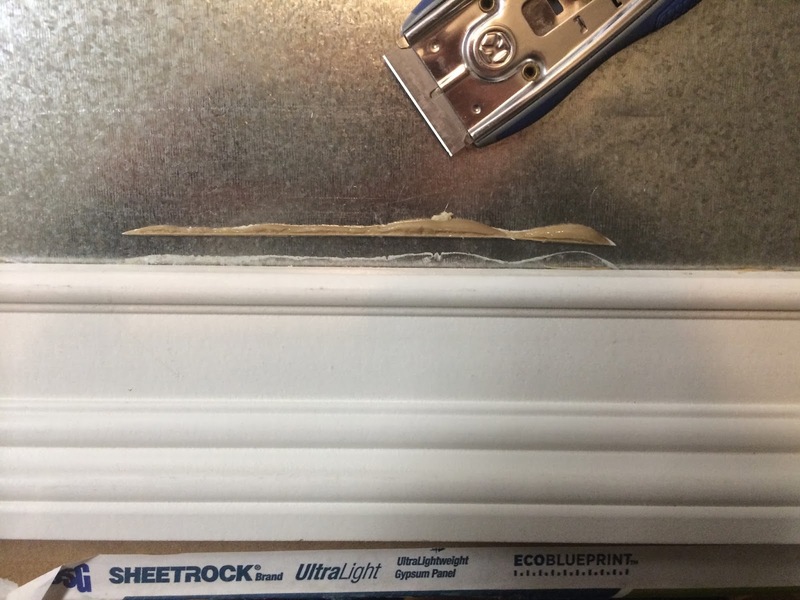 We also had some glue that oozed out so to take care of that we used a razor blade and cut it out. The directions say you can wipe it off right away or cut it later and since we are working with metal we decided cutting it out would be best. So what I did was while the board was laying flat I took a piece of painters tape from one D-ring to the other and stuck it to the board. I then marked the top of the rings where the hangers would be on the tape. We had a laser level set up on the wall so it would all be nice and level and put the tape on the wall along that line and nailed in our picture hangers and then tore the tape down. And here you have it! Our Scrum board! With magnetic labels attached! We decided not to all the columns just yet. I can't decide whether or not I want to paint the frame just yet because (fingers crossed) I'm hoping to borrow my friends Silhouette Cameo or get my own. What do you think? A small hint of color, a bright bold color, or leave it as is? 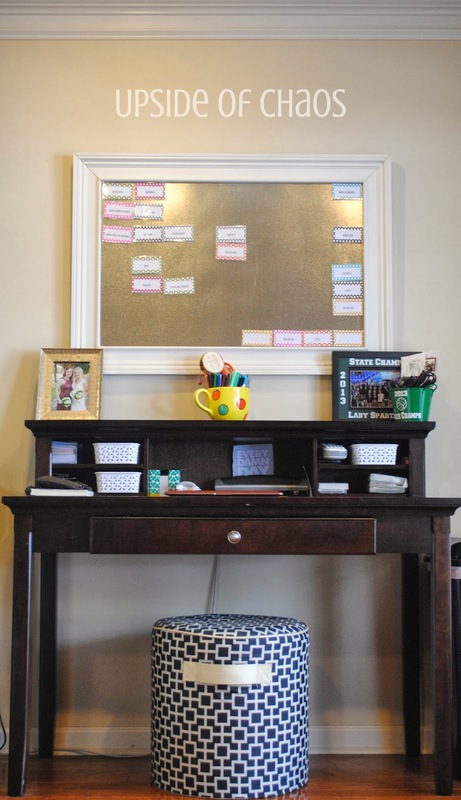 What's your favorite method for keeping your family organized in tasks that need to be done around the house?